I always love to look at other CF blogs and see their philosophies and get ideas from. Below is a great blog for training CF Athletes. Scroll through them and comment on your thoughts. Have a great weekend everyone!!! 2. I can get someone 70% of the way there in the Olympic lifts in about 3 hours. At that point, the limiting factor for men is usually shoulder and hip mobility. For women, its front squat and overhead squat strength out of the bottom. 3. If you aren’t a total idiot with what you eat, you should set a PR pretty much every time you step in the gym for the first 2 years. 4. The shorter the workout, the longer the warmup should be. You need to warmup for 35 minutes for Fran. You need to warmup for 5 minutes for Murph. 5. Unweighed unmeasured Paleo eating works best if you’ve done “The Zone” first. Your Zone experience will give you a ballpark idea of how much you should be eating. If you don’t come from a “Zone” background, you’ll likely do things like sit down and eat 85 Macadamia nuts and wonder why you aren’t losing any weight. 6. As you get better, you need to take a back off week about every fourth week (not because of injury). You can still come in and workout, but take some more rest days and just chill out. 7. You don’t need to learn to butterfly kip. Seriously, stop it. You are going to hurt yourself and you’d be much better off working toward a bodyweight press. 8. Dumbbells are the most under appreciated piece of equipment in the gym. 9. Prior runners do not need supplementary running to improve their run times. People without a running background do. I think this mostly has to do with learning to pace correctly. 10. You can’t just train weaknesses. It’s too depressing. Every now and then, pick something you are amazing at and crush it. 11. You can get away with a lot of inefficiencies if you’ve got a strong grip. Do more farmers’ carries. 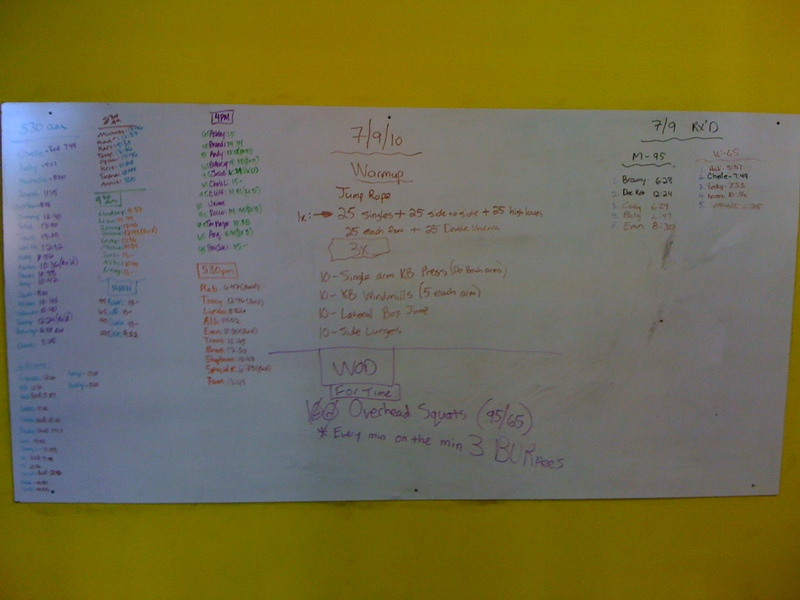 This entry was posted on July 9, 2010 at 5:20 pm and is filed under Crossfit Philosophy. You can follow any responses to this entry through the RSS 2.0 feed. You can leave a response, or trackback from your own site. Hah I am a total idiot with what I eat!!! That’s why I crossfit, so I can continue to eat like an idiot.